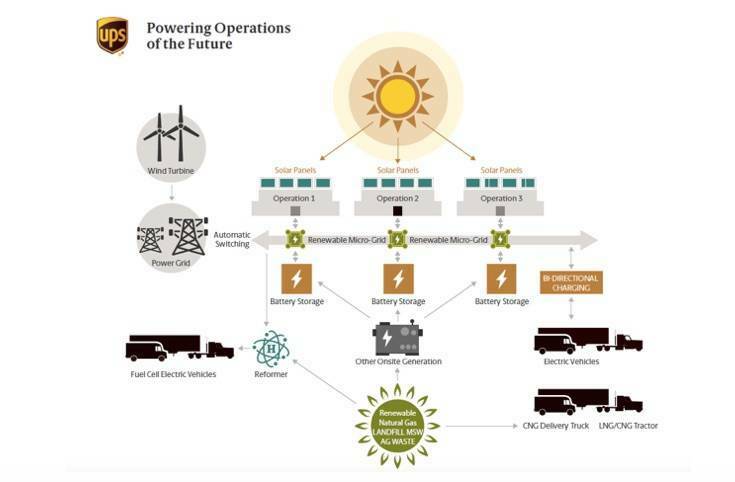 A new system allowing the recharging of a whole fleet of electrical vehicles without an upgrade to the power grid has been installed by a consortium led by UPS, the international logistics, carriage and delivery group. The technology enables UPS to increase the number of vehicles at its central London site from 65 to 170, its entire fleet in the capital. The company says this marks the beginning of the end for reliance on combustion engine-powered vehicles. The system embraces the use of second-life batteries, a conventional power upgrade, on-site storage, a smart grid, which involves smart meters and appliances and renewable, energy-efficient methods, and local power generation from solar and other alternative sources. Peter Harris, UPS Europe’s sustainability director, said: “UPS thinks this is a world first, right in the heart of a mega-city. “We are using new technology to work around some big obstacles to electric vehicle deployment, heralding a new generation of sustainable urban delivery services both here in London and in other major cities around the world. “Electric vehicles are an integral component within UPS’s alternative fuel and advanced technology fleet. UPS has developed the system with UK Power Networks Services, a sustainable energy company, and the Cross River Partnership, a public-private group set up to lead London regeneration projects. Funding has come from the Office for Low Emission Vehicles, the UK government body encouraging the auto industry to manufacture environmentally acceptable products. UPS first used electric vehicles in the 1930s and reintroduced them in 2001. Today it has more than 300 electric vehicles and nearly 700 hybrid versions in Europe and the US.